As in 1956, the Count Basie Orchestra also visited Switzerland in 1959. The concert they gave at the Kongresshaus in Zurich on February 6 was filmed – probably for the swiss television company. In Otto Flückiger’s archives I found a VHS tape with the TV broadcast from the Kongresshaus. Since I noticed that “The Midget” from this concert already can be found on youtube, I decided to offer you something else. So here you have the opening part of the TV broadcast. The orchestra starts with Basie Boogie, and after that they play Neal Hefti’s Lil’ Darlin’. The latter is especially remarkable because it offers the rare opportunity to hear as well as see a solo by Wendell Culley (1906–1983), as Basie usually gave most of the trumpet solos to Joe Newman or Thad Jones. The personnel on this date: Wendell Culley, Thad Jones, Snooky Young, Joe Newman (tp); Henry Coker, Al Grey, Benny Powell (tb); Marshal Royal (as,cl); Frank Wess (as,ts,fl); Frank Foster, Billy Mitchell (ts); Charlie Fowlkes (bar); Count Basie (p, ldr); Freddie Green (g); Eddie Jones (b); Sonny Payne (dr). Update (December 16 2011): Meanwhile everybody on these photos has been identified. Thanks to Peter Vacher and Bill Lee! I had a request from Yvette Porter Moore who was in search for photographs of her Grand Uncle Wendell Culley. Culley (January 8, 1906 – June 1983) played trumpet with Noble Sissle, Lionel Hampton (from 1944 to 1949) and Count Basie (from 1951 to 1959). Indeed I found a photo in the Otto Flückiger archives that showed Wendell Culley and Duke Garrette 1948 in Lionel Hampton’s band. You can see this photo on Yvette’s blog. When I looked for further photographs of Culley, I discovered a handful of photos showing different members of the Count Basie orchestra when it was touring switzerland in 1956. Most probably these were taken by Ernest Zwonicek in Geneva. It would be nice to know for sure though. I am not really a specialist on Basie, so I could not identify each and everyone. But I had help! 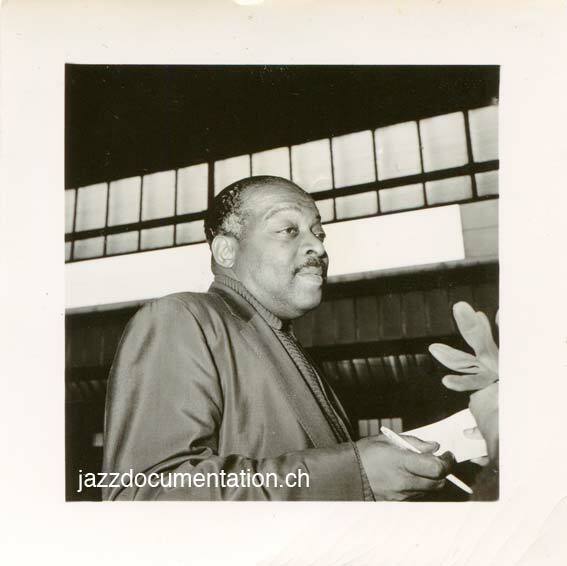 First up is a photo of Basie himself, probably taken at the Geneva train station.